Neck Sleeving Machine is provisioned with high speed servo motor. Neck Sleeve labeling machine is compact in size. Neck Shrink Sleeve machine provides precise labeling and less possibilities for damage or material loss. It is compatible with positioning rule and bottle pressing mechanism therefore consumers can obtain reliable labeling operation. 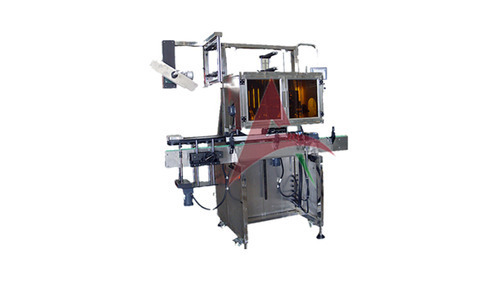 This neck shrink sleeve equipment is exclusively made for labeling operation over bottle neck and for shrink labeling over bottle mouth and the shrinkage of labeling is done with the help of electrical heating. We, at swati polypack , are proud to introduce ourselves as one of the top-notch companies holding a field of expertise in manufacturing & exporting finest quality packaging machines used in various industrial applications. Our range of products include shrink sleeve applicator , wad inserting machine , induction cap sealer machine , cap lining machines, cap assembly machines , shrink tunnel, shrink wrapping machine, complete powder filling line machines, liquid / viscous filling machines, pickle filling line , granules filling line, air cooled and water cooled induction cap sealing machine, labeling machine, sachet pouch bagging machines & tube filling-sealing machines , cup filling machine, bottle / jar heat sealing machine for neck. We also specialize in manufacturing induction wads , self adhesive sticker & shrink sleeve labels in roll form with our plant. We also provide project consultancy services for our clients . Today, with more than 300 customers across the world, we have become one of the dominant players of the market. Our transparency in the business & maintaining proper business ethics has enabled us to achieve this altitude of success.